Probably the ultimate summer treat, this dessert is literally translated to mean “shaved ice” and that’s basically what it is. Simple and elegant in its most traditional form, kakigori is served with syrup and a sweetener, such as condensed milk. And because many varieties of syrup flavours are available, there are all sorts of exciting tastes to choose from. 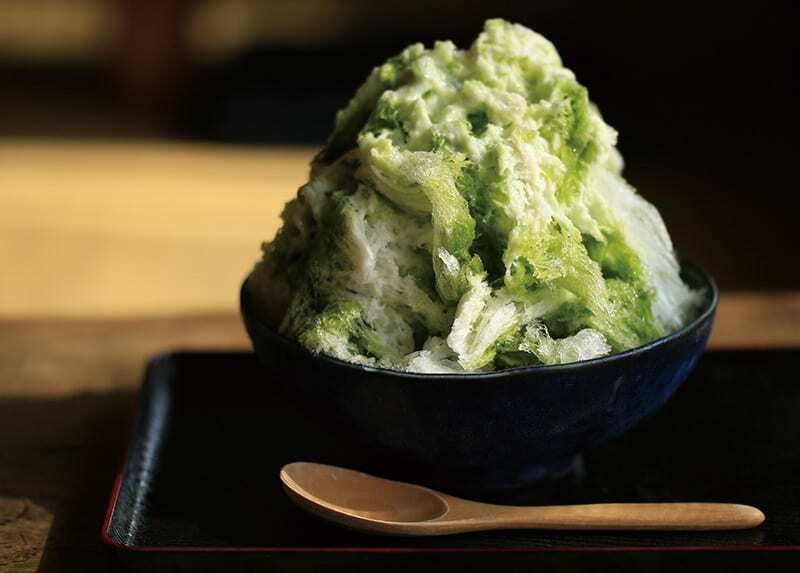 Even though it has been around since at least the 11th century, kakigori was initially only enjoyed by the Japanese aristocracy. It was looked upon as a sign of wealth as a lot of work had to be put into it, in order to preserve the blocks of ice that would then be turned into the shaved ice treat when summer rolled around. It became more popular in the 19th century when ice became more widely available. These days, however, it’s found on almost every street corner in Japan. The dessert has been revitalised and reinvented by many over the years. There are different variations of it available now, from old-school just-ice options to modern twists with a range of ingredients added to it. Thanks to these unique concoctions, it has also made its mark in the 21st century as a very Instagram-worthy dessert. The pyramid of thinly-shaved ice is, by itself, a godsend on a hot and humid day. But why just have ice when you can turn it into a colourful dessert? Traditionally, popular toppings are seasonal fresh fruits and whipped cream, green tea and red bean, sometimes with small pieces of shiratama dango (sticky rice cake). These days, even more varieties of toppings are available, including sweet potato, tiramisu, butterscotch and sake husk. Some kakigori cafes also use mountain spring water so that the purity and minerals of the ice are magnified. In fact, kakigori is comparable to the Singaporean dessert, ice kachang, which is popular all year round thanks to the tropical heat.